Internet Trends of 2017 #infographic ~ Visualistan '+g+"
Each year digital marketers around the world eagerly wait for Mary Meeker of Kleiner, Perkins, Caulfield and Byers (KPCB) to share her Internet Trends Report at the Code Conference. This year’s 355-page slide deck is filled with charts, graphs and stats that are inspiring and educational – plus some shockers. 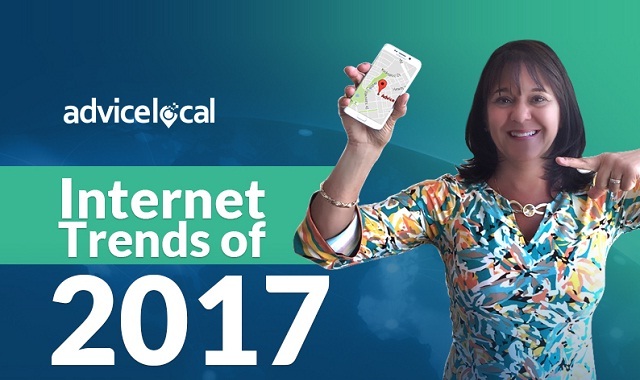 At Advice Local, we review the deck each year, dissect the trends presented and bring you the top trends as an infographic – Internet Trends of 2017. Keep scrolling to see the graphic.